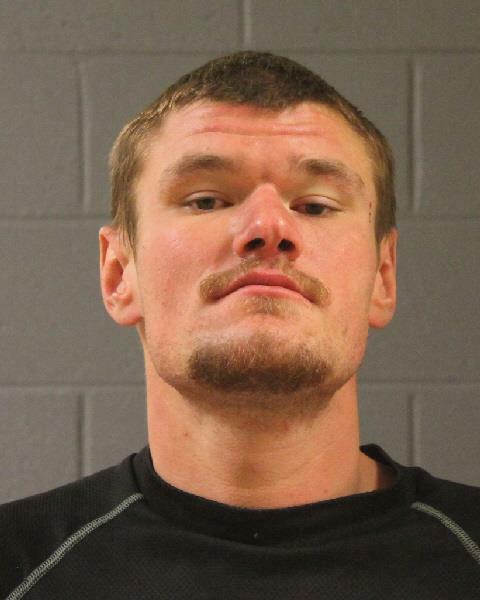 ST. GEORGE – A 23-year-old man led police on a wild multistate police chase in an SUV he had allegedly stolen from the Buffalo Wild Wings parking lot in St. George. The pursuit ended in Nevada Tuesday about 20 miles outside Las Vegas after the stolen vehicle and a Washington County Sheriff’s deputy both hit spike strips. Authorities arrested Richard Travis Kellar following the hour-long pursuit, which began around 1:22 a.m. Tuesday when police spotted a gray 2007 Toyota Sequoia near Interstate 15’s Exit 4 that had been reported stolen from the restaurant parking lot moments earlier, according to a probable cause statement filed by the Washington County Sheriff’s Office in support of the arrest. A sheriff’s deputy attempted a felony stop of the vehicle at Exit 2, the report states, but Kellar reportedly sped off in the stolen vehicle, heading south towards the Virgin River Gorge at 90 mph. The vehicle was reportedly straddling the center lane of the Interstate and swerving back and forth as it came out of the Gorge around 1:36 a.m. and reached speeds of 100 mph. The Arizona Department of Public Safety took over as lead of the pursuit for some time before relinquishing the lead back over to the Sheriff’s Office at around 2 a.m. During that time, Kellar took Nevada I-15 Exit 112, near Bunkerville, to get off but got right back onto the Interstate. Since Arizona and Nevada authorities in the area at the time reportedly didn’t have spike strips, Utah law enforcement attempted to pull ahead of the Arizona trooper and the Toyota to try to place spikes in the stolen vehicle’s path further down the road, but Kellar wouldn’t let them pass. Nevada Highway Patrol took the lead of the pursuit near Nevada milepost 68 on I-15 and placed spike strips near milepost 66. The Toyota and a sheriff’s deputy ran over the spikes around 2:20 a.m., about 4 miles north of Love’s Travel Stop. Though the spike strips flattened three of the Toyota’s tires, the statement read, Kellar continued for a few more miles before exiting near the truck stop at Exit 64, the interchange with U.S. 93. Authorities took Kellar into custody around 2:30 a.m.
“When I made contact with the driver and asked him why he took the car, he made a comment that he needed to get to California,” the sheriff’s deputy wrote in the report. Kellar was arrested and transported back to Utah where he was booked into the Washington County Purgatory Correctional Facility. According to booking information, he was arrested on charges of two second-degree felonies for theft and possession of a stolen vehicle, a third-degree felony for fleeing by vehicle, two class A misdemeanors for theft and reckless endangerment, and a class B misdemeanor for reckless driving. As this report is published, court records do not yet reflect charges filed by the county attorney. According to Utah Court documents, Kellar was arrested by Washington City Police on Jan. 12 for shoplifting and criminal trespass to which he entered a guilty plea. is this what you used to tell your boy? how’d that work out? I always listened to my momma when she wasn’t in prison or was on parole. Looks like them Duke boys are at it again.